The Seven Seas Mariner, as the world's first all-suite, all-balcony ship, will take you to exotic destinations like Africa, India, Asia, the Caribbean, and more! 700 lucky guests will enjoy fine dining by Le Cordon Bleu, and four unique open-seating restaurants! 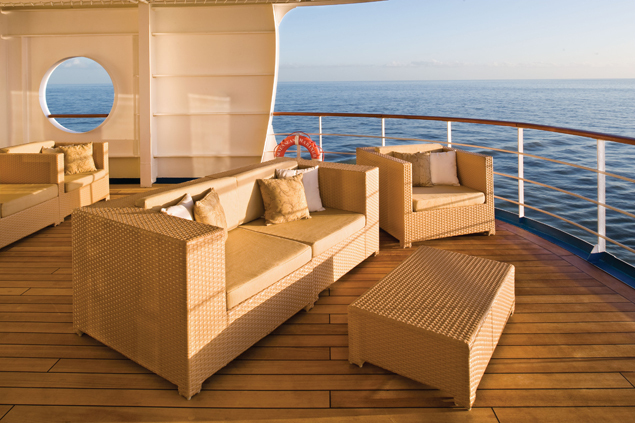 The six-star tradition of Regent Seven Seas Cruises is upheld on this fine vessel, with amazing service provided by well-trained staff, who number one per six guests to provide you with better service! Your experience on the Mariner will be unlike any other! 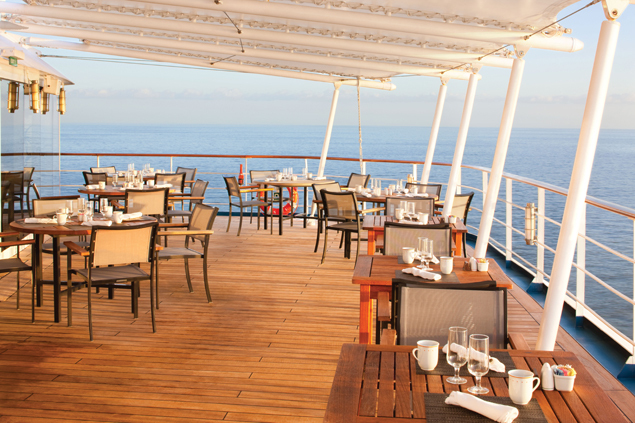 On the Seven Seas Mariner, guests can enjoy a vast array of activities. Onboard enrichment includes special guest lectures that take the notion of enrichment to the next level, beyond traditional shipboard activities - enjoy Le Cordon Bleu cooking workshops, seminars for both beginner and experienced bridge players, and more including photography! The Club Mariner Program is a complimentary youth program designed for young travelers and supervized by enthusiastic and experienced staff. Youngsters can enjoy all kinds of great age-appropriate activities that will stimulate as well as entertain them! 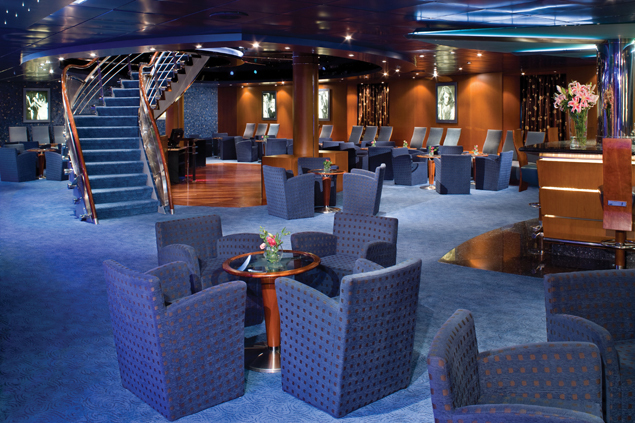 The ship also has a well-stocked library, an art gallery that holds auctions, Duty-Free boutiques, and more! The ship has golf cages, shuffleboard, paddle tennis, and a full-circle jogging track! You can also enjoy a large heated pool, two whirlpools and poolside table tennis on the deck! The fitness center is state-of-the-art, and boasts lifecycles, free weights, striders, stairmasters, treadmills, a Nautilus machine, and even Pilaties, Yoga and Aerobics classes! If you'd like to relax, head to the Canyon Ranch Spa! The Canyon Ranch spa is unrivalled in their approach to health and beauty! Enjoy an elegant meal on the Seven Seas Mariner in the main dining room, or in one of three other specialty restaurants! The Compass Rose, as the main dining room, serves the finest continental cuisine for each meal of the day! As the largest restaurant on board, there is space for everyone and most guests are treated to the view from a picture window! 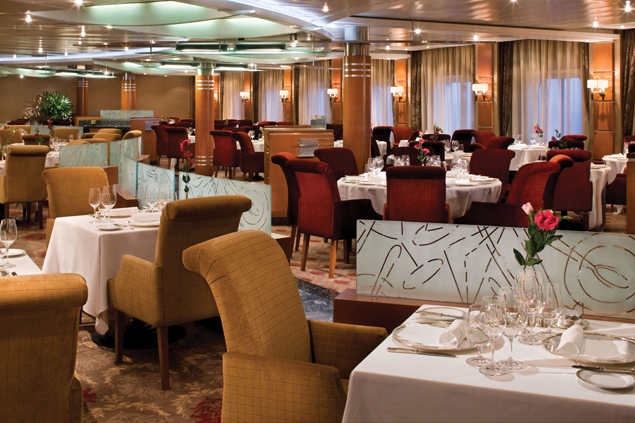 La Veranda offers a casual atmosphere for elaborate breakfast and lunch buffets, while Prime 7 is the most intimate restaurant on the ship - this glamorous steakhouse has avant-garde appetizers, soups and desserts as well as tantalizing steaks, lamb, pork, poultry and seafood specialties! Finally, you can also dine in Signatures, where authentic French cuisine is served in the legendary Le Cordon Bleu style! Afternoon High Tea is accompanied by fresh scones and other delicacies each afternoon, and best of all, you can order dinner and other meals in your suite with the complimentary 24-hour room service! Entertainment on the Seven Seas Mariner means an amazing experience. Choose from a myriad of activities every evening! The Constellation Theater, which is two-tiered for maximum seating, hosts a live orchestra, cabarets, feature productions including professional ballroom dancers, comedians, and more! 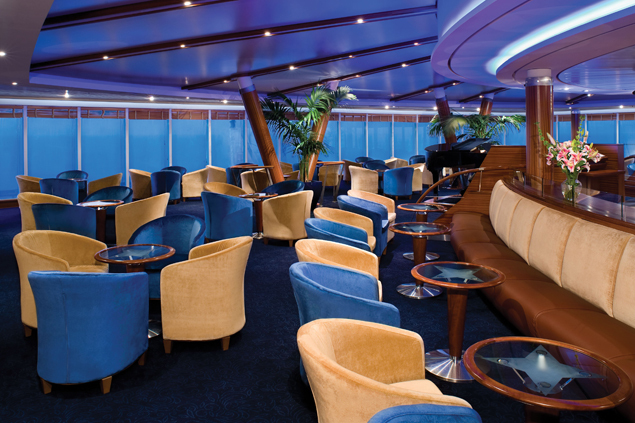 The ship has several lounges that are open late into the night; sing karaoke wiht your friends, dance late into the night at the nightclub, or enjoy a cocktail at any of the great lounges. The Observation Lounge is a romantic spot where you can spend time with that special someone accompanied by the sounds of a grand piano or singer! 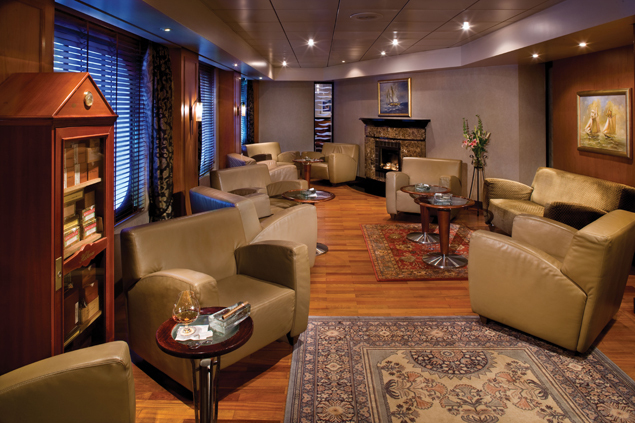 The Conoisseur Club is a cigar lounge where you can enjoy a hand-rolled cigar and a whiskey in comfort and style! There's even a casino if you're in the mood to try your luck - play blackjack, roulette, stud poker, craps, and there are also slot machines!